An ultimate golf & leisure destination on the shores of the magnificent Red Sea..
Egypt has more to offer than just wonders of antiquity, with its magnificent Red Sea. The calm cascading waters and the majestic desert and surrounding mountains are always a breathtaking view. Live a different experience right here at Madinat Makadi, a new fashionable destination in Egypt situated on Safaga Road just 30 km away from Hurghada International Airport. Madinat Makadi covers two and a half million square meters. The first hotel was built in 1998. Today, Madinat Makadi has 11 hotels of 4 and 5 stars categories catering to international clientele and guaranteeing them memorable stays. Madinat Makadi’s immense natural attractions are coupled by first-class accommodation, luxurious suites and deluxe lodging located directly on the beach oriented with friendly service, genuine hospitality and devoted staff to whom you’re always a priority. The fashionable complex is filled with the essential services and entertaining venues. It has one of Egypt’s biggest waterparks, so you’ve got 50 slides and chutes on tap. A Luxurious Mavida Spa everyday temptations. For sports’ fans, we’ve built a Championship Golf Course and Academy, a Tennis Academy is underway. Not to mention “Souk” Makadi, that consists of a variety of shops, world class restaurants as well as entertainment outlets. The five star Jaz Aquaviva Resort is the destination for the most family-friendly, luxurious all inclusive beach holiday in Egypt. The resort is located in the heart of Madinat Makadi, only 30 km away from Hurghada International Airport. The main attraction of Jaz Aquaviva is “Makadi Water World” Egypt’s largest aqua park built over 40, 000 sqm, featuring 50 adrenalin-pumping water slides for all family members. The Resort encompasses 487 state-of-the-art- rooms that spread over four clusters, perfect for families, couples & equipped with all of the needs of today’s discerning travelers. Jaz Makadi Saraya Palms offers a luxurious collection of spacious studios and suites close to the executive 9-hole practice golf course at Madinat Makadi Resort. 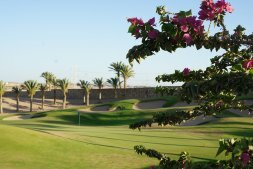 Located just 30 km south of Hurghada International Airport, it is 1 km from the beach and only minutes away from Madinat Makadi Souk and a full 18 hole championship golf course. Jaz Makadi Saraya offers superior Five-start holidays righty in the heart of Madinat Makadi only 300 - 700 metres from the beach. This new and vibrant holiday destination provides something for everyone. You can explore the Red Sea or simply relax on the stunning beaches of Makadi Bay. The Souk Makadi complex with a variety of restaurants and shops at the heart of the development is very close to hand. The Jaz Makadi Saraya is setting new standards of quality and luxury in a warm and relaxing atmosphere having gained an Eco Resort award and been voted a TUI Environmental Champion Award for 2006 and 2008. Jaz Makadi Star Resort & Spa is a real oasis on the Red Sea. Located in Madinat Makadi, 30 Km from the diving centre of Hurghada, Jaz Makadi Star Resort & Spa offers all the ingredients for a perfect relaxing holiday in Egypt. Stylish and intimate with personal service and deluxe amenities, this resort is all about total relaxation. Pamper body and soul and give in to the allure of the warm waters of the Red Sea and a long, sandy beach. The Luxurious Makadi Spa will reinvigorate your being. Jaz Makadina is situated on a secluded stretch of a spectacular beach. Cool yellow colors dominate the exterior of this Nubian-Moroccan influenced resort that won TripAdvisor’s “Egypt Top 25 Hotels for Service – 2012”, “HolidayCheck Top Hotel -2011”, the “ISO 14001” in 2010 &the Holiday Check Award in 2008 just to name a few. Inside, simple yet elegant furnishings and well-appointed rooms offer stunning views of the coastline, the extensive pool, or the surrounding landscaped gardens. Renowned for its house reef, the calm sheltered waters of MakadiBay promise unforgettable diving and snorkeling experience even for the novice. Steigenberger Makadi Hotel is nestled on the picturesque shores of Madinat Makadi and amidst the magnificent Makadi Golf Course. Madinat Makadi is 617 acres of new and thriving holiday Egypt destination with an impressive variety of five-star hotels, family resorts and deluxe accommodation that provides something for everyone: the wonders of antiquity, the magnificent Red Sea with its stunning beaches, majestic desert and mountains and Souk Makadi shopping complex. Iberotel Makadi Beach is a premium Five-star luxury Egypt holiday resort in the beautiful Madinat Makadi area. This extensive, new and thriving holiday Egypt destination boasts an impressive variety of Five-star hotels, family resorts and deluxe accommodation that provides something for everyone. You can appreciate the wonders of antiquity, the magnificent Red Sea and stunning beaches of Makadi Bay, majestic desert and mountains and the Souk Makadi shopping complex at the heart of the development. Iberotel Makadi Oasis Club is designed for families, friends and couples. This 4-star "all-inclusive" resort lies directly on Makadi Bay, 250 meters from the private beach within the Madinat Makadi resort complex and about 35 km from Hurghada. Makadi Bay" provides an ideal setting for a family holiday resort with its beautiful beach and interesting local reef. The highlight of the Oasis Club is the large freshwater pool and its proximity to the services and amenities of its sister resort, the Makadi Oasis & Family Resort. Together, the Makadi Oasis & Family Resort and the Makadi Oasis Club are the largest hotel and holiday complex within Madinat Makadi. Guests can enjoy Makadi's Aqua Park which is located 3 KM from the hotel with extra charge, also shuttle bus available for free. Iberotel Makadi Oasis & Family Resort is built in the style of an Arabian village and is directly opposite the Iberotel Makadi Beach. This 4-star "all-inclusive" resort makes a holiday in Egypt simply more enjoyable with easy access to sand, sea and amenities all readily to hand in the Madinat Makadi area. This new and thriving holiday Egypt destination boasts an impressive variety of hotels, family resorts and deluxe accommodation that provides something for everyone. Sensimar Makadi Hotel is an attractive Nubian/ Moroccan style resort built to make sure your holiday is as memorable as possible, no matter how relaxing or active you want it to be! Beach and water sports are just a few of the daytime activities that the hotel has to offer. Take a diving course and get up close to the famous house reef of Makadi Bay, or look down from above as you snorkel across it. On land, hire a Quad bike or a 4 x 4 and experience the thrills of speeding across the sands or the romance of a desert safari. In the evening, enjoy freshly prepared international buffets or choose from a tempting range of speciality and a la carte dining options available in Madinat Makadi town. Sol Y Mar Makadi Sun is a real retreat for sun and fun lovers and within easy walking distance of Souk Makadi. This charming all-inclusive Four-star resort provides a stylish Egyptian-Nubian ambience using calming pastel colours and light, airy interiors with easy access to the fantastic beach. Enjoy one of the many activities or feel free to simply lie in the sun or relax in the shade at the marvellous pool.